Originally dubbed “Cetaphil Cleansing Lotion”, the first product was invented by a pharmacist in 1947 for dermatology needs. In its early years, Cetaphil Cleansing Lotion was only available from select pharmacists but quickly became a highly recommended product by dermatologists, pediatricians, and other healthcare professionals for common skin conditions. Due to consumer demand, more drugstores began selling the increasingly popular cleanser and by the 1980s it was available at all major retail stores across North America. 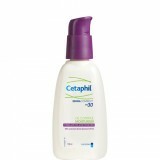 Cetaphil® Gentle Skin Cleanser still uses the original formula developed in 1947. It remains in high demand, with about one bottle sold every minute – proving the popularity of our Gentle Power!